A replacement for the old suspension bridge that carried the A92 across the River South Esk in Scotland. 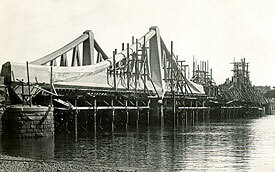 The new bridge was partly supported by a system of concrete chords echoing the appearance of steel suspension systems. It looked like a suspension bidge but was in fact a double cantilever. The bridge was demolished in 2004. Although it received little attention in Britain, this unusual contrast between material and structure attracted plenty of debate in the American engineering press. The approach and abutments of the previous bridge were re-used and the new one erected between them. It had a level, 11m wide roadway of beam and slab structure, flanked by 2.4m wide walkways and supported at the abutments on inverted, triangular concrete 'shoes'. Three spans carried the deck across the river. The central section was 65.8m wide and the two anchor spans measured 45.7m each. Support for the bridge from beneath was provided by two pairs of concrete piers that stood on concrete piles 18m deep, and from above by reinforced concrete chords. The top chord was curved, and each section contained seventy-six, 38mm steel reinforcing bars. It was this density of steel reinforcement that led to the debate about the efficiency of involving concrete at all. Montrose Bridge was the largest and most prestigious bridge that Williams designed with Aryton.